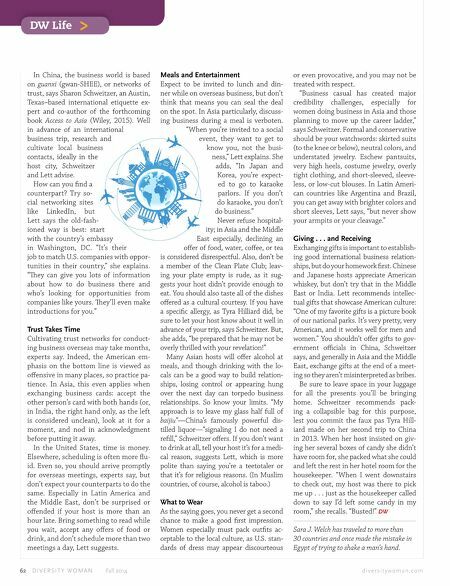 DW Life > 62 D I V E R S I T Y W O M A N Fall 2014 d i v e r s i t y w o m a n . c o m In China, the business world is based on guanxi (gwan-SHEE), or networks of trust, says Sharon Schweitzer, an Austin, Texas–based international etiquette ex- pert and co-author of the forthcoming book Access to Asia (Wiley, 2015). Well in advance of an international business trip, research and cultivate local business contacts, ideally in the host city, Schweitzer and Lett advise. How can you fnd a counterpart? Try so- cial networking sites like LinkedIn, but Lett says the old-fash- ioned way is best: start with the country's embassy in Washington, DC. "It's their job to match U.S. companies with oppor- tunities in their country," she explains. "Tey can give you lots of information about how to do business there and who's looking for opportunities from companies like yours. Tey'll even make introductions for you." Trust Takes Time Cultivating trust networks for conduct- ing business overseas may take months, experts say. Indeed, the American em- phasis on the bottom line is viewed as ofensive in many places, so practice pa- tience. In Asia, this even applies when exchanging business cards: accept the other person's card with both hands (or, in India, the right hand only, as the left is considered unclean), look at it for a moment, and nod in acknowledgment before putting it away. In the United States, time is money. Elsewhere, scheduling is often more fu- id. Even so, you should arrive promptly for overseas meetings, experts say, but don't expect your counterparts to do the same. Especially in Latin America and the Middle East, don't be surprised or ofended if your host is more than an hour late. Bring something to read while you wait, accept any ofers of food or drink, and don't schedule more than two meetings a day, Lett suggests. Meals and Entertainment Expect to be invited to lunch and din- ner while on overseas business, but don't think that means you can seal the deal on the spot. In Asia particularly, discuss- ing business during a meal is verboten. "When you're invited to a social event, they want to get to know you, not the busi- ness," Lett explains. She adds, "In Japan and Korea, you're expect- ed to go to karaoke parlors. If you don't do karaoke, you don't do business." Never refuse hospital- ity; in Asia and the Middle East especially, declining an ofer of food, water, cofee, or tea is considered disrespectful. Also, don't be a member of the Clean Plate Club; leav- ing your plate empty is rude, as it sug- gests your host didn't provide enough to eat. You should also taste all of the dishes ofered as a cultural courtesy. If you have a specifc allergy, as Tyra Hilliard did, be sure to let your host know about it well in advance of your trip, says Schweitzer. But, she adds, "be prepared that he may not be overly thrilled with your revelation!" Many Asian hosts will ofer alcohol at meals, and though drinking with the lo- cals can be a good way to build relation- ships, losing control or appearing hung over the next day can torpedo business relationships. So know your limits. "My approach is to leave my glass half full of baijiu"—China's famously powerful dis- tilled liquor—"signaling I do not need a refll," Schweitzer ofers. If you don't want to drink at all, tell your host it's for a medi- cal reason, suggests Lett, which is more polite than saying you're a teetotaler or that it's for religious reasons. (In Muslim countries, of course, alcohol is taboo.) What to Wear As the saying goes, you never get a second chance to make a good frst impression. Women especially must pack outfts ac- ceptable to the local culture, as U.S. stan- dards of dress may appear discourteous or even provocative, and you may not be treated with respect. "Business casual has created major credibility challenges, especially for women doing business in Asia and those planning to move up the career ladder," says Schweitzer. Formal and conservative should be your watchwords: skirted suits (to the knee or below), neutral colors, and understated jewelry. Eschew pantsuits, very high heels, costume jewelry, overly tight clothing, and short-sleeved, sleeve- less, or low-cut blouses. In Latin Ameri- can countries like Argentina and Brazil, you can get away with brighter colors and short sleeves, Lett says, "but never show your armpits or your cleavage." Giving . . . and Receiving Exchanging gifts is important to establish- ing good international business relation- ships, but do your homework frst. Chinese and Japanese hosts appreciate American whiskey, but don't try that in the Middle East or India. Lett recommends intellec- tual gifts that showcase American culture: "One of my favorite gifts is a picture book of our national parks. It's very pretty, very American, and it works well for men and women." You shouldn't ofer gifts to gov- ernment ofcials in China, Schweitzer says, and generally in Asia and the Middle East, exchange gifts at the end of a meet- ing so they aren't misinterpreted as bribes. Be sure to leave space in your luggage for all the presents you'll be bringing home. Schweitzer recommends pack- ing a collapsible bag for this purpose, lest you commit the faux pas Tyra Hill- iard made on her second trip to China in 2013. When her host insisted on giv- ing her several boxes of candy she didn't have room for, she packed what she could and left the rest in her hotel room for the housekeeper. "When I went downstairs to check out, my host was there to pick me up . . . just as the housekeeper called down to say I'd left some candy in my room," she recalls. "Busted!" DW Sara J. Welch has traveled to more than 30 countries and once made the mistake in Egypt of trying to shake a man's hand.